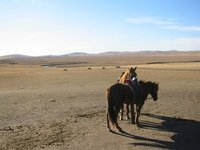 Inner Mongolia (内蒙古) is long province stretching from the far west, bordering Gansu province, all the way north, around Mongolia, to Russia. The term Inner Mongolia comes from the Manchurian government dividing the north and south of Mongolia during the Qing Dynasty. This area has shifted between the Mongolians, Chinese and Manchurians for most of history, although heavy settlement of Han Chinese did not occur until the 19th century. The Qing government, being afraid of the Russians, encouraged large number of Han farmers to move into the area in the late 19th century. Subsequent governments have maintained the policy and reinforced it by building railroads and highways. Today Inner Mongolia is an autonomous area for Mongolians, even though Han Chinese make up 79% of the population and Mongolians only make up 17%. The Mongolians in the area are trying hard to hold onto their nomadic lifestyle and have a love for their animals. The easiest way to make a Mongolian friend is to tell them that they have a pretty horse, camel or sheep. Although Inner Mongolia is supposed to be a 100% bi-lingual, Chinese and Mongolian, in the more remote areas Mongolian is still the dominant tongue. There are many great sights and activities to see in Inner Mongolia but most of Inner Mongolia is a sensitive border region with Russia and Mongolia. Because of the huge distances it is very time consuming to travel around by land. This has made it possible for Inner Mongolia to offers many hidden treasures. In southwestern Inner Mongolia the geography is mainly desert, such as the Tengger Desert, with mixed grasslands framed by mountains along the southern border. Adjacent to the Yellow River Valley there is farming and heavy industry. While north of the Yellow River is the Gobi Desert. As the area progresses north there is more woods and open grassland. The far northern parts are large rolling grasslands that are quite stunning. There are also some very large lakes such as Hulun Nur. Inner Mongolia shares domestic borders with Gansu, Ningxia, Shaanxi, Shanxi, Hebei, Liaoning, Jilin and Heilongjiang. It also shares international borders with Russia and Mongolia. For more information about crossing over land please read the article: Overland Border Crossings In China. Bayan Hot is a nice outpost town on the desert with a lovely Mongolian Buddhist temple. Hohhot is the capital of the province and an interesting town. Baotou is Inner Mongolia’s largest city and is very industrial. Erenhot is the border town with Mongolia. Wuhai is one of the most polluted cities in the world. Manzhouli is a wild and crazy border town with Russia and is also the jumping point to Hulun Nur. Hailar is a nice city on the plains and home to a great beer. All major Chinese and Mongolian holidays are celebrated. The big Naadam, horse festival, is held in Hohhot every summer when the grass is greenest. 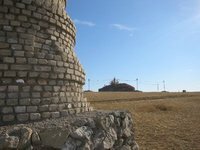 There are also smaller Naadams in other towns in Inner Mongolia. Inner Mongolia can have very hot summers and very cold winters. Even during the summer the nights can get pretty chilly in certain parts of the desert. Just be prepared for any kind of weather year round. The sand storms can also be horrible in the spring/summer time. Inner Mongolia stretches across a huge area of China. This makes it hard to give general statements about how to get there. Therefore it is best to look at the individual towns or areas. In general the northern and central parts of Inner Mongolia can be easily reached by different train lines. The far western parts can only be accessed by bus. Some areas are sparsely populated so hitchhiking might be risky, especially in bad weather. The main airports are in Baotou, Hohhot and Hailar. There are also smaller airports in Ulanhot, Tongliao, Xilinhot and Chifeng. Traveling around Inner Mongolia is getting easier. Once again it covers a huge area that is sparsely populated. This can make for lots of time sitting in buses or trains. Luckily most of the northern and central parts of Inner Mongolia have a good train system. There are also several airports in northern and central Inner Mongolia. The two combined together make it very easy to travel around and between northern and central Inner Mongolia. The far west is a different story. It is actually easier to get to some areas of western Inner Mongolia from the neighboring provinces of Gansu and Ningxia. The western parts can only be accessed by bus and it is mostly a vast desert. In the same breath the scenery is stunning and most of the villages feel like outpost towns with the sand dunes moving closer every day. Mongolian food is mutton, mutton and more mutton. There are the classic Chinese options also if you don’t want mutton anymore. One thing to try is Hot Pot (火锅), which originally came from Mongolia. Although today most hot pot you get in China is more like the Sichuan version, even in Inner Mongolia. This is version 9. Last edited at 7:15 on Aug 16, 17 by Utrecht. 19 articles link to this page.